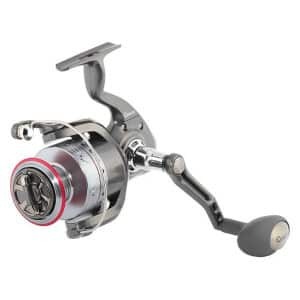 1000-b ball bearing drive, digigear, aluminum spool. 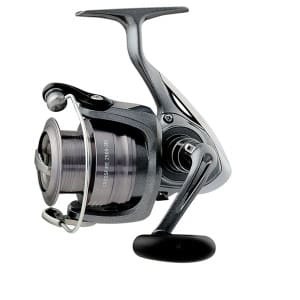 These value-packed spinning reels offer a high level of fishing performance without the high price tag. 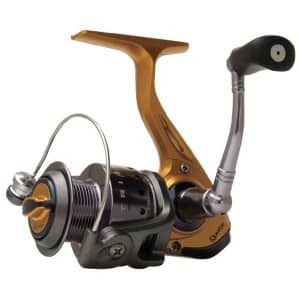 The Optix spinning reels are loaded with features including a strong and lightweight graphite body, solid brass pinion gear, TRU-Balance™ rotor design, and much more. The light, yet strong composite body adds strength without adding weight. Long Stroke® spool design lays line evenly and minimizes tangles. Ultrasmooth drag system is readily adjustable for optimal control. 4 ball bearing, aluminum spool, on/off anti reverse. Choose your size from 20, 25, or 30. Performance and style combine in the Agility to create an excellent value. 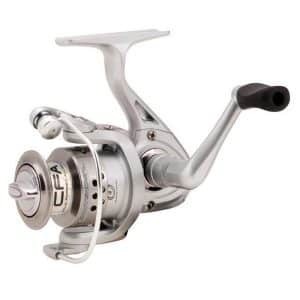 The Agility spinning reel contains a 4+1 bearing system for a smooth retrieve. 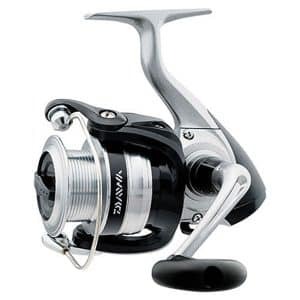 The double anodized ported aluminum spool reduce weight and provide corrosion resistance. Complete with a multi-disk drag system provides great fishing performance. Quality components and high end features make the Shakespeare Crusader the best value in the market. 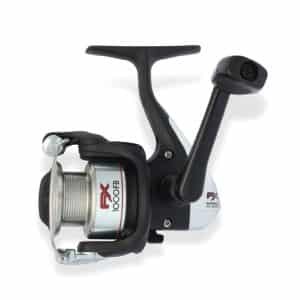 Shimano® FX spinning reel . Graphite frame, sideplate and rotor . Diecast aluminum spool . Varispeed® provides consistent spool speed. Dyna-Balance® eliminates wobble during the retrieve by counter-balancing the rotor to enhance sensitivity and smoothness . Super Stopper® II anti-reverse uses a one-way bearing that eliminates backplay . Power Roller® II reduces twist from casting and retrieving. Line Retrieve Per Crank: 26″ . Line Capacity: 200 yds of 6-lb test; 140 yds of 8-lb test; 120 yds of 10-lb test . Maximum Drag: 6.5 lbs . Bearings: 1 BB . Gear Ratio: 4.6:1 . Weight: 8.4 oz . Line Retrieve Per Crank: 22″ . Line Capacity: 270 yds of 2-lb test; 140 yds of 4-lb test; 110 yds of 6-lb test .